Bangkok (Thailand) – September 9, 2017 (travelindex) – The Embassy of the Republic of India in collaboration with the Rembrandt Hotel Bangkok will host the “Uttar Pradesh Food Festival” from 11 – 16 September. The largest Indian food festival of the year celebrates the 70th anniversary of diplomatic relations between India and Thailand. The regional Mughlai cuisine is being created by 5-star chefs at the multi-award winning Rang Mahal, the best Indian restaurant in Thailand. The “Uttar Pradesh Food Festival” presents authentic cuisine from the Mughal era. Uttar Pradesh is well known for its cuisine which was introduced into India during the medieval period by the great Mughal kings. Mughlai cuisine varies from mild to spicy and is often associated with the distinctive aromas and tastes of eight ground spices. This festival will take you to a medieval period where kings used to treat their palace guests with mouth-watering delicacies, kebab meats and exotic curries. This biggest Indian food festival will bring Chef Santosh Kumar and Chef Sanjib Bandyopadhyay from the central region of the Indian sub-continent together with Chef Rajan Misra, master chef of Rang Mahal to create a Mughlai buffet of main dishes and accompaniments. THB 500++ for set lunch and THB 990 ++ for buffet dinner. The Rembrandt Hotel Bangkok general manager, Mr Eric Hallin, said “We are honored to be joining with the Embassy of the Republic of India to organize the largest Indian Food Festival of the Year to celebrate 70 years of good relations between India and Thailand. We are ready to welcome Thai diners to experience Mughlai cuisine at Rang Mahal, the internationally recognised 23-year-old Indian restaurant. We are confident that this Indian food festival will create an unforgettable gourmet experience”. 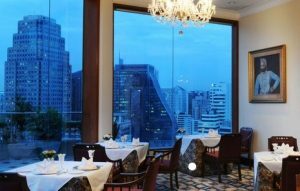 The Rembrandt Hotel is centrally located in the heart of Bangkok off Sukhumvit Road. Guests may access our hotel either from Sukhumvit Soi 18 or Sukhumvit Soi 20 as our property extends the length of the block. We offer luxury, outstanding services, and facilities for all travelers to Bangkok, Thailand. The property is conveniently located near the central business district as well as shopping attractions, city landmarks and vibrant nightlife. Our guests also have the benefit of all major public transportation stations in Bangkok as both skytrain (BTS Asoke Station) and metro (MRT Sukhumvit Station) are just a short 5-minute walk from the hotel or guests may ride a complimentary 24-hour ‘tuk tuk’ shuttle service to the main road. This quality hotel is a great location for both tourists and business travelers, who will find easy access to Sukhumvit and the Bangkok CBD.